I wondered how and why this anthology came to be, so I asked Candlesticks and Daggers editor Kelly Ann Jacobson a few questions to find out. See my interview with Jacobson and a link to their submission guidelines below. HOPKINSON: Tell me a little bit about Candlesticks and Daggers. JACOBSON: Candlesticks & Daggers will be an anthology of mixed-genre mysteries. The anthology will include mostly fiction but also a few poems and potentially a few nonfiction pieces. My anthologies are solo projects—so I receive the manuscripts, read them anonymously, select the pieces that will go in the book, and create the book itself—but I do always ask a guest judge to decide who wins the contests (winner gets $50 and finalist gets $25). All contributors selected for inclusion will receive one copy of the book. HOPKINSON: How/why did Candlesticks and Daggers come to be? JACOBSON: I’m looking for any short story or poem (or even personal essay!) that tells a mystery story. As long as it’s mystery + another genre, it’s fair game for this anthology. I always read anonymously, so no personal information on any of the attachments. Short stories have to be shorter than 7,500 words and poems no longer than three pages each (poets can submit up to three poems), but I prefer shorter works. Stories can’t have been previously published before the book comes out, though afterward, writers are of course free to republish wherever they would like. JACOBSON: I love local lit mags and journals, especially Northern Virginia Review, Gargoyle Magazine, Barrelhouse, District Lit, and Beltway Poetry Quarterly. My favorite from outside the DMV is Iron Horse Review (getting a short story published with them was pretty much the highlight of my life). JACOBSON: The email for all Candlesticks and Daggers submissions is CandlesticksAndDaggers (at) gmail (dot) com. As I mentioned, please make sure your name isn’t on any of the attachments, and make sure you explain in your email letter why your piece fits the theme of the book. It’s also great if writers include a brief (three sentences or less) bio about themselves. All submissions must be received by November 1. 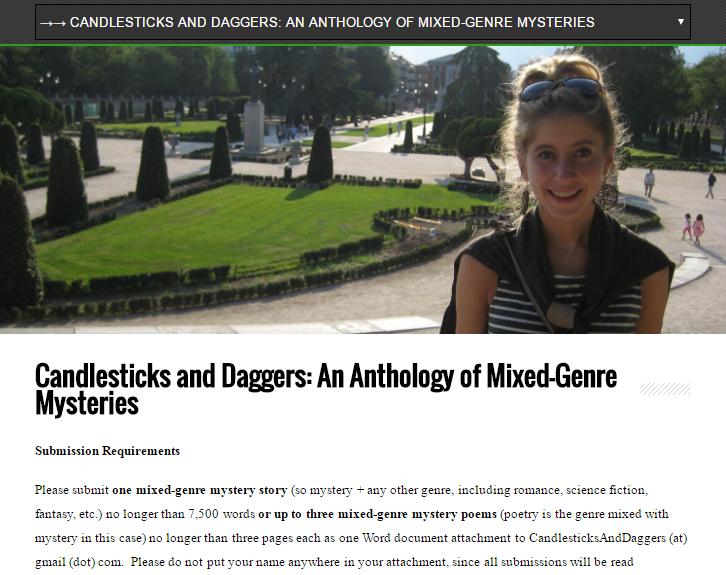 More submission details can be found at http://www.kellyannjacobson.com/anthologies/candlesticks-and-daggers. JACOBSON: The best way to reach me quickly with time-sensitive questions is at my author email, kellyannjacobson (at) gmail (dot) com. However, any submissions sent to this email address will be discarded. My poem “Notes from Owl Bar’s Diary” published in Volatile When Mixed + how to find a writers’ group in your state!